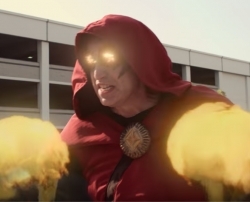 Los Angeles, CA, April 09, 2019 --(PR.com)-- After months of waiting in anticipation, fans of Dark Specter will finally be able to see the “Fiery Face of Fear” back in action on May 1 via Facebook Video release. The saga continues as Bertrand (a.k.a. Dark Specter) squares off against superhero Vibraboom—causing shock and public hysteria as their town is damaged by this unknown supervillain. The stark contrast of Bertrand’s double life is highlighted even further in "Dark Specter 2" as he cares for his well-meaning but mentally ailing mother. It is clear that the Dark Specter is conflicted with his passion for global destruction and his desire to care for his mother. It is this dynamic that has garnered praise for "Dark Specter 2’s" unique take on the superhero/supervillain genre. Last but not least, director Richard Tatum won “Best Director” for his work on "Dark Specter 2" at Mindfield Film Festival Albuquerque 2019. "Dark Specter 2" is a must see short film in a series which is on the rise. Fans of comic/superhero themes will appreciate the action, special effects, and its unique approach to the genre. Fans of dramedy will likely enjoy its comic relief and thoughtful plotline. For more information on the Dark Specter series, visit http://www.darkspecter.com/. To coordinate media coverage, feature "Dark Specter 2' on your site, or arrange an interview with one of the cast, please contact Stephen at SMTentertainment@gmail.com.